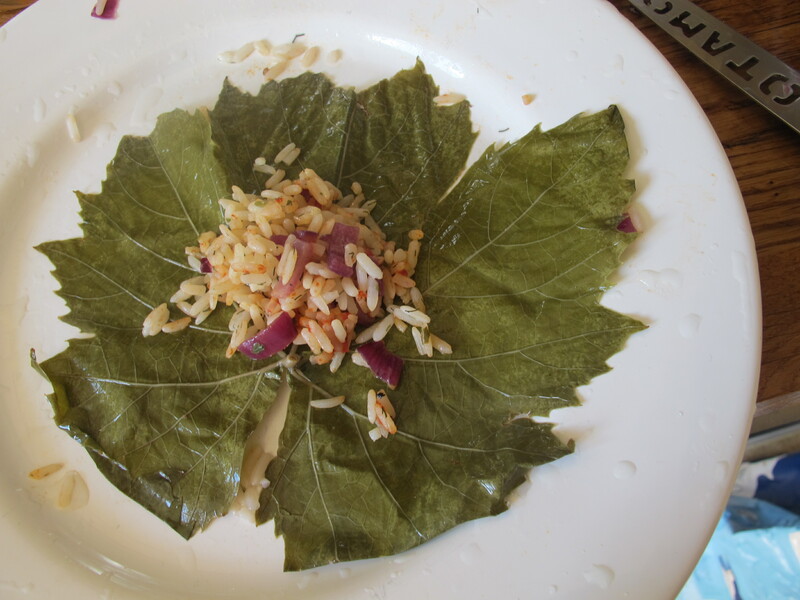 I LOVE eating dolmades, or stuffed vine leaves, but they are so expensive to buy in the shops. Last time I bought them from the supermarket I paid about £3.50-£4.00 for 4 or 5 little vine leaves and as I am not content to only eat a couple at a time I decided to make them myself! 1. As my vine leaves were from a packet and pickled in salt brine, they needed to be washed in two different changes of water. If you don’t do this the resulting dolmades will taste overly salty. 2. Cook the rice as per packet instructions. Separately heat oil in a frying pan and add the onion and fry until translucent. 3. Next add the rice, tomato paste, mint, dill and parsley and season if you wish (I never do). 4. This should now start to smell like the familiar stuffed vine leaves aroma- yum – and the next stage is to make the little parcels. In the photo above you can see that I lined another frying pan with vine leaves (preferably broken ones if any) in preparation for the following stages. 5. You need to remove the stalks from the leaves and spread them out with the veined underside facing upwards. Place a little of the rice mixture you have made into the centre of the leaf then fold the sides over into the middle and roll up. 6. This part is probably the most time-consuming element- making all the little parcels. The mixture should make about 30 parcels depending on the size of your vine leaves. These need to be arranged side by side in the pan and can be fitted snugly next to each other to prevent them unravelling during cooking. You can add more rolls on top of bottom layers if need be. 7. The next stage is to tuck the sliced garlic in between the dolmades, then pour on the olive oil, water, sugar and lemon juice. Any remaining leaves can be placed across the top of the layers and then a heavy plate is to be placed on top to cover most of the surface. 8. Put the lid on the pan, bring to the boil and then simmer for approximately 30/35 minutes or until the water has gone. Take care to check while cooking as you don’t want the bottom of the pan to burn and I find cooking times vary greatly. 9. Your lovely dolmades should now be ready to eat and enjoy!! Looks delicious, can’t wait to have a go!! Next Post Climate change: what can I do to help?